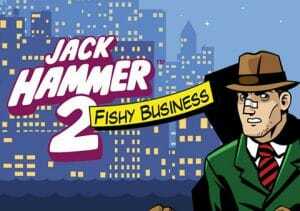 Grand City’s greatest private investigator gets a second case to solve in Jack Hammer Fishy Business, a 5 reel, 99 payline video slot from Net Entertainment. Just like the original, Fishy Business comes with Sticky Win re-spins as well as a bonus feature that awards up to 20 free spins, initially, with all payouts doubled. You can play from as little as 50p to as much as £250 per spin. NetEnt has kept things pretty similar to the original in this second outing for Jack Hammer – once again, comic strip visuals dominate the reels. They’re superbly done, summoning up an atmosphere of bootleggers and speakeasies. Look out for microphones, gun-shaped violin cases, barrels, speedboats and harbour side dens. There are 4 higher value symbols: a pair of goons; chief baddie Don Crabby; Pearl and Jack Hammer himself who’ll get you 500 coins if you land 5 on a payline. There’s also a standard wild that replaces everything bar the scatter. The main feature on offer is the Sticky Win feature – after every winning spin, the successful symbols are held and a re-spin follows. These keep on coming until there’s a spin where no new winner is added. Jack Hammer Fishy Business also comes with a Free Spins feature which is triggered by the electric eel scatter. Landing 5 of these will get you 10 free spins. 6 offers 13 with 16 awarded for 7 scatters. 8 or more and you can look forward to 20 free spins. A second random wild symbol is added to the middle 3 reels during the feature – all payouts during the feature are boosted by a 2x multiplier and doubled too. You can retrigger more free spins, with up to 40 in total possible, but the extra free spins are not subject to the 2x multiplier. NetEnt has retained most of the elements that made Jack Hammer’s maiden outing such a hit. The sound and visuals are as attractive as before and there’s a nice range of features. Once again, the Sticky Win feature is central to proceedings – get on a roll here with a high value symbol and the coins can build up extremely quickly. The free spins feature isn’t bad either with the 2x multiplier and extra wild nudging things along nicely. The variance here is slightly higher than in the original with the volatility in the medium to high range. We enjoyed the first outing for Grand City’s top gumshoe and the sequel is equally entertaining. Jack Hammer Fishy Business is well designed and offers plenty in the way of features. With bumper payouts of 1,980 times your stake of offer, this private eye adventure is well worth investigating.